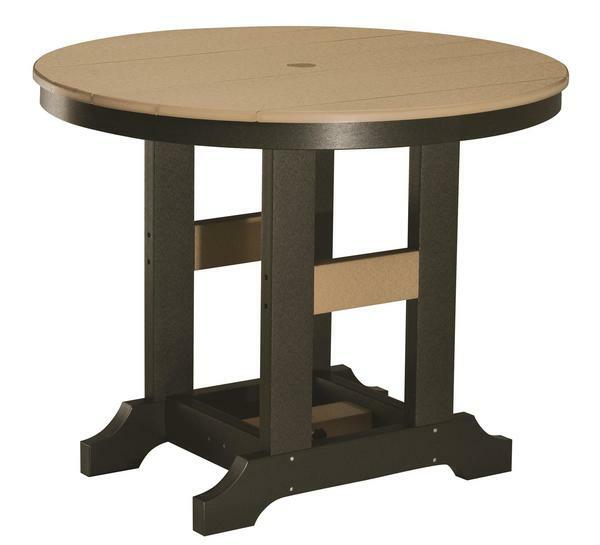 Our Berlin Gardens 38" Round Classic Dining Poly Patio Table is sure to be the centerpiece to your outdoor dining space. With room to comfortably seat four - this intimate dining table is great for family and friends and will give you a place to take advantage of those beautiful days and enjoy every get together, barbecue or evening meal! Each table comes with a center umbrella hole, so you can have shade on those warmer days and add a bit more style to your decor as well! Poly lumber, which is manufactured from recycled milk jugs and detergent bottles, is an ideal material for constructed outdoor furniture. These recycled plastics are used to form a piece of "lumber" - similar to traditional wood lumber - but with a uniform color that will not chip, crack, rot, or develop mold. Each piece of poly lumber is handcrafted by Amish woodworkers to make a piece of furniture that is constructed to last decades. And, because your poly furniture is made for the outdoors, it will require very little maintenance and will never crack, splinter, rot, warp or develop mildew. If it does get dirty through normal use, simply wash your furniture with soap and water (or bleach and water) to return your pieces to their original look.